One of the Jewish tribes in Medina that, like the Banu al-Naḍir, seem to have consisted chiefly of descendants of Aaron. They inhabited the villages Maḥzūr, Bir Abba, and Buath on the eastern side of Medina; and also held fortified positions in the neighborhood. Toward the end of the fifth century many notable Jews, the majority of whom appear to have belonged to the Banu Ḳuraiẓa, were massacred in consequence of the treachery of one of the Arab chiefs. A Ḳuraizite woman, named Sarah, bewailed the disaster in a dirge, which is still extant. 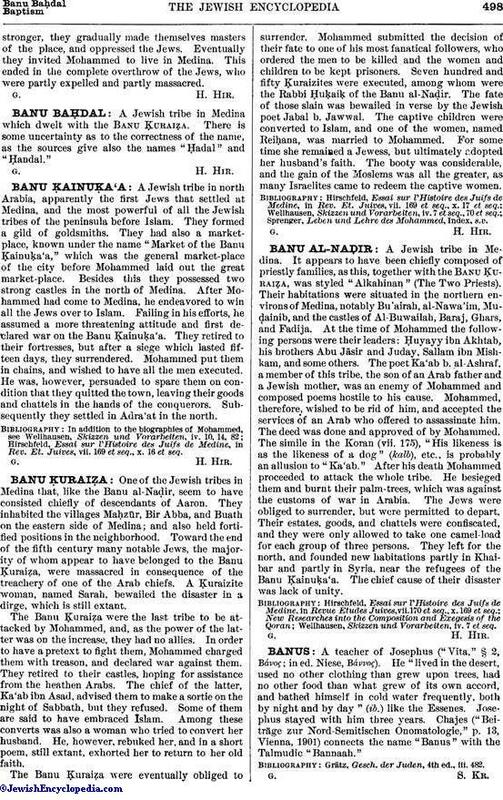 The Banu Ḳuraiẓa were the last tribe to be attacked by Mohammed, and, as the power of the latter was on the increase, they had no allies. In order to have a pretext to fight them, Mohammed charged them with treason, and declared war against them. They retired to their castles, hoping for assistance from the heathen Arabs. The chief of the latter, Ka'ab ibn Asad, advised them to make a sortie on the night of Sabbath, but they refused. Some of them are said to have embraced Islam. Among these converts was also a woman who tried to convert her husband. He, however, rebuked her, and in a short poem, still extant, exhorted her to return to her old faith. The Banu Ḳuraiẓa were eventually obliged to surrender. Mohammed submitted the decision of their fate to one of his most fanatical followers, who ordered the men to be killed and the women and children to be kept prisoners. Seven hundred and fifty Ḳuraizites were executed, among whom were the Rabbi Ḥuḳaiḳ of the Banu al-Naḍir. The fate of those slain was bewailed in verse by the Jewish poet Jabal b. Jawwal. The captive children were converted to Islam, and one of the women, named Reiḥana, was married to Mohammed. For some time she remained a Jewess, but ultimately adopted her husband's faith. The booty was considerable, and the gain of the Moslems was all the greater, as many Israelites came to redeem the captive women. Sprenger, Leben und Lehre des Mohammed, Index, s.v.